This image of the boulders on Comet 67P/C-G was taken by OSIRIS on Aug. 16, 2014 from a distance of 65 miles (105 km.). Image released May 18, 2015. 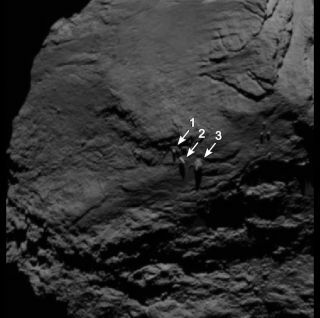 Three boulders balancing like ballerinas on the surface of a comet were spotted by the Rosetta space probe. The Rosetta spacecraft first spotted the three boulders on the surface of Comet 67P/Churyumov-Gerasimenko in September 2014, with mission scientists unveiling the photos today (May 18). Images taken from different angles reveal that the three closely spaced boulders all appear to be similar to "balancing rocks" seen on Earth, which often look as though they might topple over at any moment. The three balancing rocks are located in the Aker region on the larger lobe of the comet (which looks somewhat like a rubber duck). The largest boulder (labelled "3" in the images) is approximately 98 feet (30 meters) in diameter and appears to be sitting on the edge of a small depression in the surface, according to the statement from ESA. The largest known boulder on the comet's surface is called Cheops, and measured approximately 147 feet (45 m) across. This image of the boulders on Comet 67P/C-G was taken by OSIRIS on Sept. 1, 2014, from a distance of 18 miles (29 km.). ESA released three different images of the boulders, taken on three different occasions: Aug. 16, 2014; Sept. 16, 2014; and Sept. 19, 2014. In the Aug. 16 image, one of the boulders looked as though it might be a thin and narrow column of rock, but the later images show more width and depth. Three unusual boulders are found in the Aker region of Comet 67P/C-G, on the comet’s large lobe (marked with square). Image released May 18, 2015. "Interpreting images of the comet's surface can be tricky," Sierks said in the statement. Depending on the viewing angle, illumination and spatial resolution, very different and sometimes even misleading impressions are created. On Earth, there are multiple ways that "balancing rocks" can come to be placed in their easily upset positions. It's possible glaciers moved the boulders there from a different location. On Earth, such migratory stones are called "erratics," according to the press release. The motion and activity of the comet may also have moved the rocks. Or, the three boulders may have been part of larger rocks, and that soft material was eroded from around the base, leaving a small contact area with the surface. This image of the boulders on Comet 67P/C-G was taken by OSIRIS on Sep. 19, 2014, from a distance of about of 18 miles (29 km.). Image released May 18, 2015. The Rosetta spacecraft arrived at Comet 67P/Churyumov–Gerasimenko on Aug. 6, 2014, and is still orbiting the icy body. The Philae lander hitched a ride with Rosetta, and jumped onto the comet's surface on Nov.12, 2014.